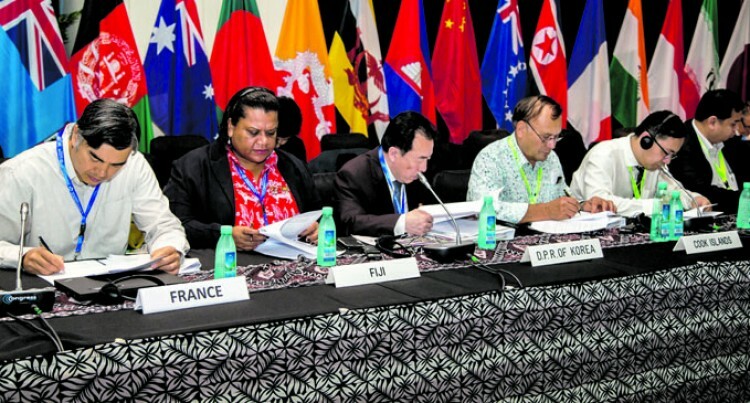 Senior officials from 46 member countries of the Food & Agriculture Organisation of the United Nations (FAO) in the Asia-Pacific region concluded their meeting on a high note yesterday. They converged in Nadi for the 34th Session of FAO Regional Conference for Asia and the Pacific since Monday and ended with useful and meaningful conclusions along with recommendations for further action. FAO Assistant Director-General and Regional Representative, Dr, Kundhavi Kadiresan said it was an opportunity to understand the views, concerns and priorities under different agenda items. “I believe we can all look back with satisfaction on the extremely productive sessions of the meeting,” she said. The recommendations have been put in draft form for endorsement during the Ministerial Roundtable on Zero Hunger which begins today. She added the deliberations covered some of the most complex issues of mutual concern with respect for the different views and opinions suggested. nMulti-year programme of work 2016-2019 for the FAO Regional Conference for Asia and the Pacific. Meanwhile, FAO hailed 40 years of close on-the-ground presence and support to ten of its member countries in Asia and the Pacific. Between 1977 and 1979, at the suggestion of FAO, ten countries agreed to host FAO Representation offices in their capitals. The 10 were Bangladesh, India, Indonesia, Lao PDR, Myanmar, Nepal, Pakistan, Philippines, Sri Lanka and Viet Nam. “When I took over as Director-General in 2012, I affirmed that FAO must be a knowledge Organisation with its feet on the ground,” Mr Graziano said. The Director-General noted that in the Asia and the Pacific region, FAO has prioritized improvements to nutrition and has taken action to ensure food security in the face of challenges posed by climate change and natural disasters. The development and implementation of Country Programming Frameworks (CPFs) have given greater focus to our technical and policy expertise, ensuring that country programmes are closely aligned with government priorities. “We cannot work exclusively from Rome. We need to expand our Representations in Asia and especially the Pacific” Graziano said. Mr Graziano thanked all 10 countries for welcoming FAO to their lands as a trusted partner on the ground and assured them that FAO would continue to work closely with them to ensure the future of agriculture and the safety and sustainability of food production.